If you like yelling at your TV, then Making a Murderer on Netflix is for you. There are very few reasons that I want to stay up past 11:00 PM. My wife and I stayed up until 2:00 AM to finish the series. I'm sure we aren't getting all of the story, but the police, lawyers, and even the judges seem completely biased against Steven Avery and his nephew. Not just biased, but actively working to make sure those two are found guilty. That's a lot different then working to solve the crime and see justice done. Interesting thoughts on scams moving from e-mail to social networks. I generally agree with their reasoning, but the point below once applied to e-mails. Now we are suspicious of e-mails from our grandmother. "They’re endorsed by your friends. You’re seeing people you know like and share these scams as that’s a condition of their “entry”. They have credibility." ... that I never want to get arrested. If you click on an individual's picture, the site even provides a convenient link to search Facebook. Check your trunk for drugs before driving back across the border from Mexico. Clever crooks are using folks to act as unwitting mules. Don't get me wrong, they don't deserved to be robbed or attacked, but who goes around talking about how much a ring costs and pays for deliveries with hundred dollar bills? 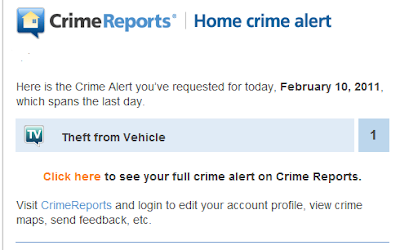 As a follow-up to my post on the Crime Reports website, I did get a report via e-mail when a crime was committed near my home. In this case, a vehicle theft. I'm pretty happy about this... if there is a local trend I can raise my threat level to code red. I was excited when I saw Knoxville News-Sentinel story about the Knox County Seriff's online crime reporting web site: http://www.crimereports.com/. You can view a map of crimes in your area and sign-up for e-mail reports. When I read the article I thought it might send real-time alerts, but it appears to have a lag. Also, the e-mail report just sends you a link back to the web site. I'd rather get a simple list of the recent crimes along with the link if I wanted to map it.